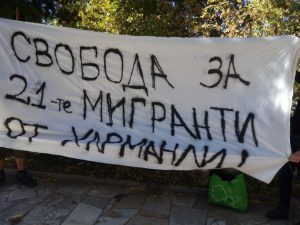 Bulgarien | You can't evict a Movement – You can`t evict Solidarity! after the riot. No police was investigated. Harmanli 21 until the new date of the trial. SOLIDARITY, JUSTICE AND FREEDOM FOR THE HARMANLI 21! This entry was posted in Balkanroute, Bulgarien, General, Harmanli21, Prozess, Repression, Solidarität and tagged 2018, Balkanroute, Bulgarien, Harmanli, Harmanli21, Prozess, Repression on 2018/05/26 by can't evict solidarity. On the 24th of April 2018, at 13:30, the first hearing of the trial about the riot in the camp took place at the Regional court in Harmanli. At already 13:00, journalists had gathered in front of the court house. Some of them were calling the accused people “21 pieces“, not people but “pieces“. This is showing the level of professionalism and objectivity the topic of migrants is being handled with by some of the media in Bulgaria. As a van arrived, packed with the accused migrants, which were accompanid by officers from the Migration Directorate, some journalists ran to take pictures and videos of the accused migrants. As one could see many of the accused people felt very unconfortable with this situation and tried to avoid being filmed or photographed. 10 of the accused migrants were present at court. They are currently waiting in the pre-trial detention in the closed camp in Lyubimets. Another 11 accused were missing. Most of the migrants were represented by public defenders and there was no representative from the State Agency of Refugees (SAR). The trial did not start yet, and the hearing was no longer than 30 minutes. The argument was searching for and sending letters to the 11 missing people, who did not appear. 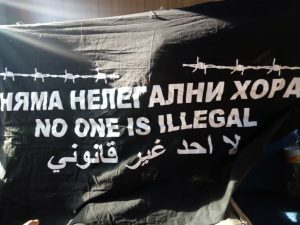 The authorities in Bulgaria are accusing the migrants in the refugee detention center of a damaging different things in the value of about 85,000 Leva (42,000 Euro). The accusations are hooliganism and property destruction. Most of the accused migrants claimed that they are innocent and were gathered randomly from the camp in Harmanli by the police. As reported before, when the police and gendarmerie entered the rooms at the night night after the alleged riot and brutally beat up migrants in the camp manypeople were sleeping. The media „professionals“ fail to notice and report on this small detail. The next hearing will be on the 5th of June, 2018 at the Regional court in Harmanli at 13:30. This entry was posted in Balkanroute, Bulgarien, General, Harmanli21, Prozess, Repression, Solidarität and tagged 2018, Balkanroute, Bulgarien, Harmanli, Harmanli21, Prozess, Repression on 2018/04/27 by can't evict solidarity. 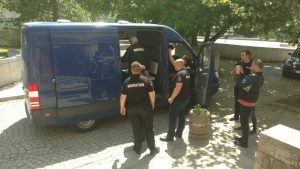 The Harmanli local district court had scheduled the court hearing against 21 Afghans, who are accused of taking part in the riot in November 2016 to start on 24th of April 2018 in Harmanli, Bulgaria. 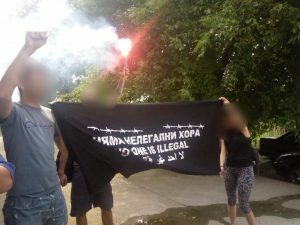 After the riot, that broke out following a protest against quarantine measures, inhabitants of the camp Harmanli (Bulgaria) accused the gendarmerie of using brutal violence. They publicly stated that the gendarmerie stormed houses while some people were sleeping, who had nothing to do with the riot. Pictures with many injuries were shared by the asylum seekers. The court hearing will take place on the 24th of April 2018 in Rayonen Sad – Harmanli (РАЙОНЕН СЪД) at Yanko Sakazov Street 1, 6450 Tsentar, Harmanli, starting at 1.30 pm. 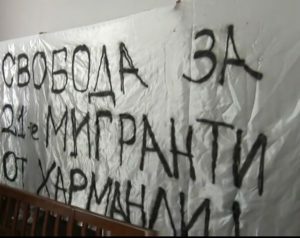 This entry was posted in Balkanroute, Bulgarien, General, Harmanli21, Protest, Prozess, Repression, Solidarität and tagged 2018, Balkanroute, Bulgarien, Harmanli, Harmanli21, Protest, Prozess on 2018/04/01 by can't evict solidarity.